For some reason calzone seems so different from a normal pizza, it’s a nice change when you get bored. I kept this recipe simple by using a bread mix instead of measuring the flour and yeast out myself. You can choose which ever fillings you like for this recipe – but I have to say I love the way the kale cooks up in this dish – delicious! And how can you ever go wrong with bacon? I thought I would try putting together a slideshow of the steps for this recipe, I’d really appreciate it if you check it out and give me some feedback! For the best affect select the “Show Info” button on the top middle-right of the screen during playback. ~ makes enough for 4, although we split it between the two of us. Original recipe based on this Kale & Salami calzone recipe from BBC Good Food. 500 grams of bread mix, I used ciabatta. 4 leaves of kale, I used curly kale. Add the bread mix to the bowl of your mixer, I used my Kenwood Chef Titanium. Follow the instructions on the packet to make the bread dough. For me this was to add 350ml of water and mix. For the mixing I used my dough hook for approximately 2 minutes. After this time it became obvious that the dough was too wet. It should be tacky but should not stick to your hands. I added a couple of tablespoons of plain flour and continued to mix. In total I added 5 tablespoons of flour and mixed for around 5 minutes. I then finally added 1 tablespoon of rapeseed oil to complete the ingredients, I continued to mix for another minute until the dough started to form a ball. Lastly I removed it from the machine and pulled it into a boule shape. Add the bread mix to a bowl, follow the instructions on the packet. After you have mixed the ingredients together if the dough is too tacky add more flour (a couple of tablespoons at a time) the dough should be easy to handle. It should be a little tacky but it shouldn’t stick to your fingers. Pull the bread into a boule shape. Most likely you will need to leave the dough to rest for 10 – 20 minutes. Pre heat the oven to the hottest temperature (mine was 250oC). in the meantime I started to prepare my ingredients. First chopping some chestnut mushrooms. Then chopping the garlic. Which I first “smooshed” (not sure thats the technical term) with the flat of my knife, before slicing as finely as I could. 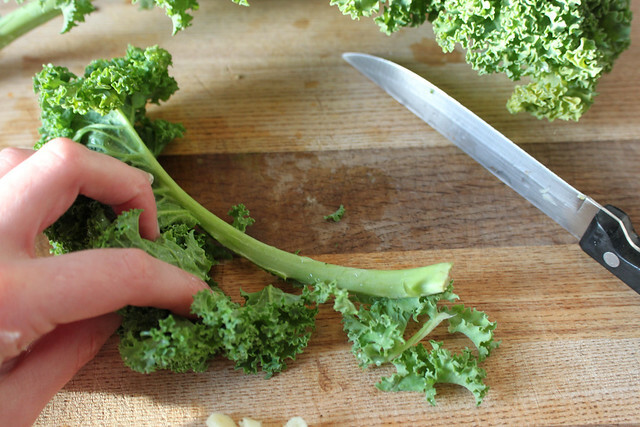 Now to cut curly kale – the easiest way is to fold it in half so the stalk is exposed, then score down the edge of the stalk. This should separate the kale from the tough stalk. Then you should rip the kale into bite-sized pieces. Cut in to small pieces and fry up the bacon in a pan, I left the rind on and omitted any oil, so the bacon cooked in it’s own fat at a medium high temperature. Add the garlic and the mushrooms to the hot pan, and gently stir the bacon so it doesn’t stick. Once the mushrooms are starting to brown up, add the kale on top. Don’t stir for a couple of minutes just let it steam cook. Gently use a fishslice (or similar) to flip the bacon on top of the kale, ensuring the kale becomes evenly cooked. If using add a generous pinch of chilli flakes. Stir to distribute evenly. Take the frying pan off the heat. Stretch out the dough on a baking sheet. To do this I turned the dough upside down and began to pull it across the sheet. By turning it upside down, the side on the baking sheet has been exposed to the air so it is slightly harder and less likely to stick to the sheet. Spread the tomato paste – or if you have time tomato paste mixed with dried italian herbs. Pour the topping onto one side of your calzone, ensuring a border to allow the calzone to close. 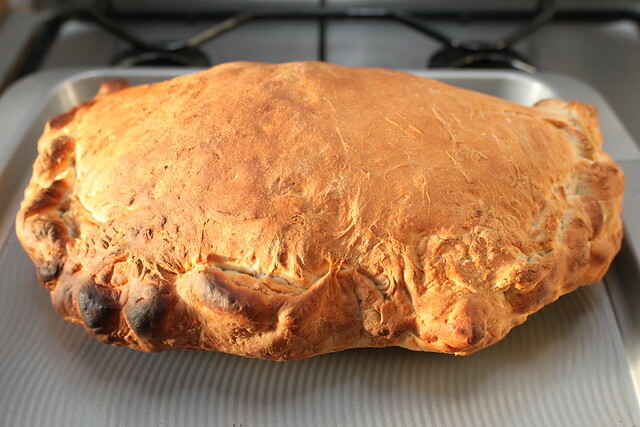 To fold the calzone, fold the uncovered side over the topping. To seal you need a pinching motion around the entire outside. Bake the calzone in your oven for around 20 minutes, till golden brown and it sounds hollow when you tap it. 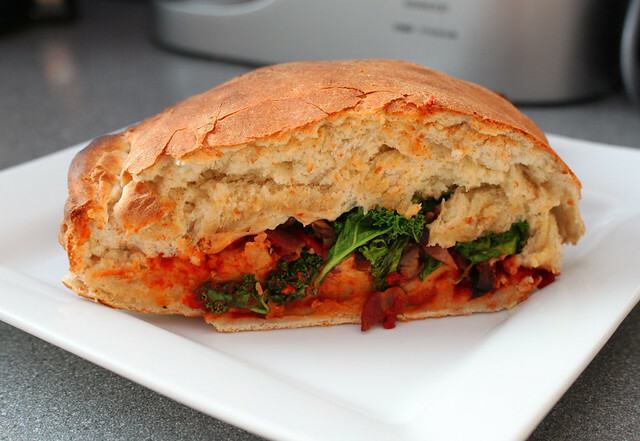 You can see all photos for this in the Bacon & Kale Calzone photo recipe. I’d love to hear your feedback on the recipe? Or on the new photo recipe feature – what did you like or not like about it? You can have a chat with me on Twitter anytime. I’m @coffeemuffins.